Every man must treasure such a day into which he can retreat when the years grow desperate. It is never the same for each. 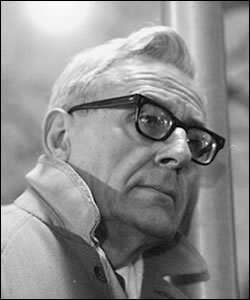 Anthropologist Eiseley was keenly aware of time and its unceasing, unrelenting, uninterruptible march forward. I believe this sensitized him to those rare instances when stillness overtakes time, ever so briefly and mystically and fleetingly. And no one has equaled Eiseley in capturing phantom stillness in literature. His most perfect day was one of those stills; so was mine. Without the wisdom of Eiseley, I may never have recognized my most perfect day. It was the last of my drifting days and if anyone were to ask what year it was—what month, what afternoon—I could not answer. I would be able to say only that it was for me the most perfect day in the world and that is why I retain its memory, safely severed from time and reality. Every man must treasure such a day into which he can retreat when the years grow desperate. It is never the same for each. For some it will be the memory of a woman, or a fading bar of music, or a successful night at a gambling table leaving you with the momentary illusion that you have won the game of life. Also the perfect day is apt to be so subjective that no one else who was with you will remember it in the same fashion, if he remembers it at all. It will be a day totally yours. Like Eiseley I could not say for sure the year when my perfect day occurred. Also, like his I know it was autumn, probably early October. I do know this; the day it happened I knew exactly what it was. And like Eiseley I’ve retained its memory, safely severed from time and reality. There is no drama in Eiseley’s perfect day. His day was no more than lying about in warm autumn sun on the loading dock of a rail station, drinking grape soda and lazily talking with a small, eclectic circle of other men who were riding the rails. “We drank the pop, bottle after bottle, like ambrosia, like forgetfulness,” he writes. My perfect day, on the other hand, was strenuous and challenging — a bicycle ride through Virginia’s Shenandoah Mountains and valleys, challenging the automobiles for our right to some inches of asphalt. It was an organized ride of Washington, DC’s Potomac Pedalers Touring Club. The “Massanutten Century” it was called, a 100-mile ride certain to strike terror into the heart of any casual bicyclist early on a sunny Sunday morning in autumn. While my day was more vigorous than Eiseley’s, it also was without drama. Really, it was no more than a free apple on a crisp autumn morning and a long bicycle ride with a few like-minded companions. The Potomac Pedalers are invited to correct my memory, but I believe their Massanutten Century ride began those days in the rural Virginia town of Marshall. Park a car, lock into bicycle pedals and ride southwest on two-lane backroads over rolling hills amid horse pastures and apple orchards. This is exactly the kind of bucolic scene evoked by the state’s tourist marketing motto, “Virginia Is for Lovers.” Unlike Eisely, I do not remember my companions on this day. I’m guessing somewhere from half to a dozen of us had risen before 5 AM to be at Marshall at 7 AM or 8 AM to start a long, challenging bicycle ride. I believe Robin Miller was there. I vaguely remember because he and I finished the ride together, chatting as we rolled into Marshall looking forward to effortless car rides to the comforts of home. Probably 15 or 20 miles into the ride a produce market appeared on the roadside. This is apple country, and the fresh apples they sell still hold a morning chill. Too tempting. This ride was demanding, and giving up a few moments of precious daylight seemed almost injudicious, but I stopped. My thin bicycle tires skittered over the dirt and gravel parking lot and I skidded to a stop in front of the apple seller. All day people come to this stand in cars. He was surprised. Astride a bicycle, what could I want? He was probably disappointed when I asked for one apple. I began fumbling around in the spandex for a coin or two. Handing me the apple he said it was free. Now I was surprised. A phrase went through my mind, it’s origin unknown: “You may not get all you pay for in this life, but you sure pay for all you get.” After a “thank you,” I bit into the big sweet red and headed down the highway literally gobbling up a piece of that autumn scenery. By mid-morning the bicycles and their riders have come onto U.S. Route 211, a big east-west highway through this part of the state. Westward, we begin a several mile climb up to the Shenandoah ridgeline where the Skyline Drive snakes north and south between Front Royal and Waynesboro in the Shenandoah National Park. I don’t remember it being a steep climb, but it seemed to go on for several miles. Meanwhile, menacing car traffic whizzes by 50 miles per hour faster than we can travel on our more primitive technology. Once topped, there is a minute to enjoy the Skyline Drive view and gulp water before the free-fall descent down the other side. Pedaling isn’t necessary, and you feel like a kid on a roller coaster. The bicycle of my most perfect day in the world. That was another thing about the road. People were always appearing from some other century, entering and exiting, as it were, at will. You never knew whether your companions were from the past or the future. Since by common consent we had no real existence, we might as well have been teleported from the future as the past. But about that it was certain that no one would talk either. Massanutten is a psych job, yes, but it’s also a real physical challenge. I’m guessing it’s a mile or two of difficult climbing; portions of it are said to be 12% to 14% grade. That means for each 100 feet you travel you gain 12 or 14 feet in elevation. A mile of 12% grade will take you over 600 feet up – like walking a mile up the steps of a 60-story building. Strong, fit, experienced bicyclists have found themselves walking a bike up this hill. Most ordinary riders never try it. I came away from lunch knowing it would be tough, but I was confident. I’d done it before, and I knew how to climb, even if it had to be at a crawling pace. But, Massanutten was friendly this day. It’s never easy, but I slowed to a dutiful pace and easily crested the ridge. It was beginning to have the feel of a perfect day. The rush down the other side of Massanutten can be frightening. There were sections of it where I exceeded 60 miles per hour. At that speed, a twenty-pound bicycle feels like a few strands of spaghetti wiggling under you. Yet it seemed like the faster you went the faster the rushing air took away the anxiety of the dreaded Massanutten. Down in the valley the ride turns northeast and heads toward Front Royal. Looking at a map today suggests we sailed along Fort Valley Road and through the George Washington National Forest. What I remember is the perfection of a road that seemed to go downhill for miles and a tailwind that made pedaling seem like something you were only pretending to do. On our right ran a picturesque stream. Along its banks I saw the families and picnics and barbecues and flying Frisbees and romping dogs of any perfect Sunday afternoon. 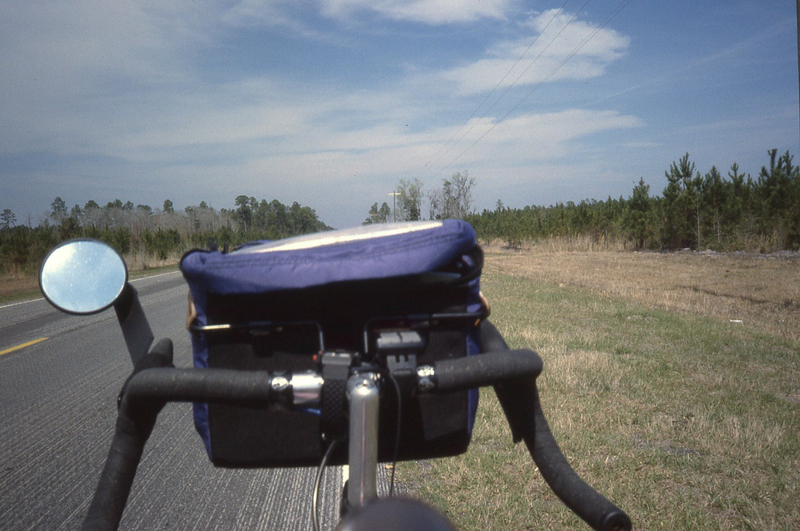 The bicycle and road under me seemed to disappear; it was almost like I floated by as a part of the wind. That was perhaps 20 amazing miles, and in all the tens of thousands of miles I traveled on bicycles, none ever came close to equaling this experience on this day. 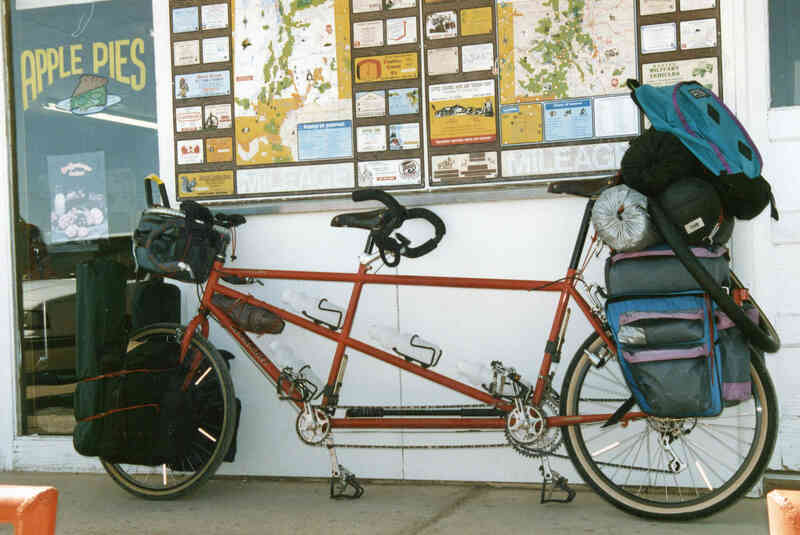 A tandem bicycle takes a break while touring Utah. I guess everyone on the ride experienced something akin to this, but how do you talk about it? We congregated for a brief break in Front Royal, and there were some suggestions that the last part of the ride was really nice, but no one could say it may have been the experience of a lifetime. Maybe it was just me. Nearing Front Royal I came across an item of highway flotsam. Many cars had run over this cardboard container that once proudly retained a pint of Hershey’s chocolate milk. It haunted my remaining miles into Front Royal. Once there, I had to have chocolate milk. In one of those “convenience store” places I found the same packaging I had seen flat and lifeless in the roadway. Here it was full and fresh and cold – and mine. Like Eiseley and companions drinking their grape soda I devoured the rich, sweet and cold chocolate milk. As I drank, it was as if I were taking in the spirit of that dead container back on the barren roadway. Rejuvenated, happy and fulfilled, I saddled up for the final 15 or 20 miles to Marshall where this day had begun. The last few miles, as I came to the outskirts of Marshall I slowed. I wanted to savor this day a bit. That’s when I knew it had been the perfect day. The sun was lowering, an hour or two before dark, I suppose. And what I wanted most was another 10 hours of sunlight – to do the ride all over again. This had never happened before. All I had ever felt at the end of other rides was relief that it was over and that I could now drive home. 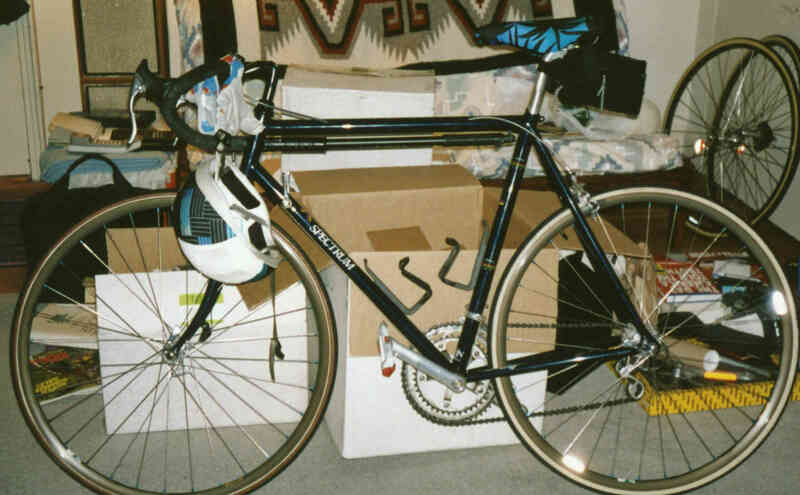 I always enjoyed the club rides, but the demand of self-propulsion over many miles was always stressful. At the end of this perfect day, I would gladly have set the clock back and begun again, immediately. Fumblingly I examine these computerized responses like a primitive seeking to understand the civilization with which I once had some personal contact. Unlike the nomads crouched in the lee of the railroad embankment, however, I can find no way of reshaping these faceless notices into an arrowpoint. Within my own lifetime I have completed the journey from my perfect day as a wanderer to an old man crouching by a wall in the October sun, glad to be left alone to his observations of insects and such small mammals as remain. Already I am as much an anachronism as the last warriors lingering helplessly along the railroad line that had destroyed the buffalo and the Indians’ way of life. Perhaps in a way, our small band of bicyclists challenged the omnipresent automobiles of that day, and in so doing found a way back in time, if ever so briefly. I know at least one of us found a way back to a perfect day. I’ll never forget it. I feel like I enjoyed that perfect day, too! Another memorable post. Thanks Bill ….I enjoyed the ride…. took me away from the mud and mold of hurrican irene and i felt wind and sun and tired legs and a good nights sleep. the sun is all we have had thank you lord,,,,,dumpsters full of ruined things, volunteers streaming in for a few hours , days, a week. wish i could gofor a bike ride. when we are done. will we ever be?